Chris Fraser, Managing Director and CEO of Sirius, commented: “2018 was a year of significant progress for the Company. Completion of procurement to support the stage 2 financing and the signing of an additional 4.8 Mtpa of take-or-pay supply agreements, have been substantial achievements. Considerable progress has been made across all our construction sites and development activities are advancing at pace. More than 800 people are now employed on the Project, demonstrating the transformational potential for jobs and growth in the local area. Sirius Minerals Plc (“Sirius” or the “Company”) provides its latest quarterly progress update. Chris Fraser, Managing Director and CEO of Sirius, commented: “2018 was a year of significant progress for the Company. Completion of procurement to support the stage 2 financing and the signing of an additional 4.8 Mtpa of take-or-pay supply agreements, have been substantial achievements. Considerable progress has been made across all our construction sites and development activities are advancing at pace. More than 800 people are now employed on the Project, demonstrating the transformational potential for jobs and growth in the local area. The Project’s Lost Time Injury Frequency Rate (“LTIFR”) stands at 3.54. The LTIFR is a measure of lost time incidents per million man-hours on a twelve-month rolling average basis. The Company continues to work closely with its employees and contractors to continually improve safety at all locations. To date, the total Project working hours exceed 2.5 million. A group of lenders and the IPA will be working closely with the Company and the lenders’ advisors to work through the due diligence reports and the detailed terms and conditions of the structure and the financing. The Company is working towards having agreed commitment letters as soon as possible. Due diligence reports have been prepared by the lenders’ advisors and the Company is engaging with prospective lenders and their consultants to address the due diligence matters that have been highlighted. The Company believes that the due diligence undertaken by the lenders’ advisors supports the Company’s Project cost estimates announced on 6 September 2018. The Company’s cash balance as at 31 December was £290 million, of which £230 million is unrestricted, which provides sufficient liquidity to fund project progress in line with the current Project schedule into the second quarter of 2019. Considerable progress has been made at the Company’s construction sites in the quarter. At the Woodsmith Mine site, the service shaft foreshaft excavation is now complete to 44m and is expected to reach the final depth of 45m in January 2019. The service shaft winder house basement is complete, with the connecting walls to the shaft and upper floor currently being installed. The service shaft permanent winder has been fabricated ready for delivery to site. The Vertical Sinking Machine (“VSM”) being used to construct the Mineral Transport System (“MTS”) access shaft was launched in October 2018, consistent with the Company’s milestone for 2018. The MTS access shaft has been sunk to a depth of 63m and sinking activities are progressing smoothly following some initial commissioning issues. Since late November cutting rates have increased by 25 per cent. and improvements are ongoing. The current VSM operational performance has provided the Company with further confidence in the assumed advance rates for the shaft boring roadheaders that will be used to sink the main service and production shafts. At Wilton, the MTS portal has been completed and tunnelling activities have commenced, satisfying the 2018 Company milestone for this activity. Current tunnelling activities are progressing using conventional excavation techniques with 13m of tunnel completed. The drive 1 tunnel boring machine (“TBM”) is expected to arrive at site during Q1 2019. 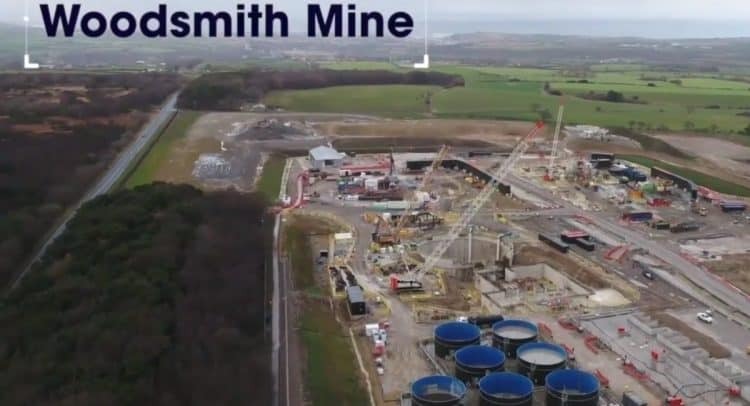 It is anticipated that approximately 125m of drive 1 will be completed prior to commencing tunnelling with the TBM in order to reach competent Redcar mudstone through which the TBM will be launched. Earthworks are underway at the materials handling facility (“MHF”) in Wilton, consistent with the 2018 milestone, and site preparation activities are currently progressing on schedule. One of the most significant achievements during the quarter was the completion of procurement for the major construction packages related to the stage 2 senior debt financing process. In November 2018, an engineering, procurement and construction contract for the development of the Company’s port handling facility on Teesside was entered into with McLaughlin & Harvey Ltd. The Company also varied its existing MTS tunnelling contract with STRABAG AG to include the engineering, procurement and construction of the fit-out of the Company’s MTS. The signing of these contracts marked the completion of procurement of the major construction packages. Through its procurement programme, the Company has established strong partnerships with world-leading constructions companies to develop the Woodsmith Mine and associated infrastructure. During the fourth quarter of 2018, the Company completed the acquisition of a 30 per cent. equity interest in each of the Cibra Group Companies for 95,000,000 ordinary shares in Sirius (the “Strategic Investment”). The Strategic Investment is linked to the supply agreement with the Cibra Group Companies for the resale of 2.5 million tonnes per annum (“Mtpa”) in peak aggregate volumes of POLY4 into Brazil and certain other South American countries. The agreement provides the Company with access to a globally important and fast-growing fertilizer market and takes the total peak aggregate take-or-pay supply agreements entered into to 8.2 Mtpa. The Company continues to progress key commercial discussions in a number of regions across the world. Negotiations in Europe are well advanced and concluding a European take-or-pay supply agreement remains the Company’s current sales and marketing priority. Sirius Mineral’s Chief Executive Officer, Chris Fraser will host a webcast for investors and analysts at 9.30am today. The webcast can be listened to live by clicking on the link below. A replay will be available on the Company’s website in due course. Over a career that takes in almost two decades with Dead Can Dance, award-winning movie soundtracks and a series of acclaimed solo and collaborative albums, Lisa Gerrard has established herself as one of Australia’s most ground-breaking and in-demand artists. Singer and composer, Lisa brings a vision that is both precise and all-embracing to everything she does. In recent years Lisa has also become a much sought-after composer of soundtracks. In many ways this has been a logical progression. Much of the work of Dead Can Dance had a cinematic quality that led to the group’s music being used in the cult movie Baraka, TV commercials and even a car chase scene in Miami Vice. Among the many films and documentaries she has scored or contributed to are Gladiator, Insider, Whale Rider, Black Hawk Down, Heat, Ali, King Arthur, Tears Of The Sun, The Mist, Salem’s Lot, A Thousand Roads, Ashes & Snow, Layer Cake, El Nino de la Luna, Balibo, Henry Poole Is Here, Solo, Playing For Charlie & Ichi. Lisa has received Golden Globe nominations for Insider and Ali and Oscar Nominations for Gladiator and 4 International awards for Whale Rider.